Scroll down for brief descriptions of neighborhoods outside Santa Fe to the south, along Highway 285 South (or click on names on the map). Eldorado at Santa Fe and Highway 285 South corridor subdivisions. Call or email Greg to help you decide which one is right for you. Easy access to the interstate and Eldorado shopping, beautiful westward views and paved streets are some of the features enjoyed by the occupants of this gated subdivision. Community water and underground utilities. Many of the one to four acre lots either border a large greenbelt or are directly across the road from it. Some of the approximately 2.5 acre to 10 acre lots in Cielo Colorado allow for horses and horse facilities. Many lots have wonderful mountain views in all directions. Community water and underground utilities. Close proximity to the interstate with easy access to Santa Fe from this subdivision with a mix of paved and base course roads, some lots with spectacular west and south facing views are some of the features of Dos Griegos. A Greek Orthodox church and readily accessible Eldorado shopping are also part of the appeal of Dos Griegos. Payments from a ground lease for discreetly located cell phone towers allows for no homeowner association charges. Community water and underground utilities. This comfortable and smallish subdivision with community water and underground utilities has western views and a Lamy mailing address. Many lots also offer views of the southern end of the Rocky Mountains and the Jemez Mountains. By far the largest and one of the more affordable areas in the 285 corridor, Eldorado is known for numerous greenbelts plus a large mountainous wilderness area, all of which are available exclusively for enjoyment by Eldorado residents. Mountain views in all directions from the gently rolling terrain. The Eldorado community school, an independent library, a senior citizens center with a Santa Fe county satellite office, clubhouse, tennis courts, a seasonal outdoor pool and two shopping centers make for convenient living. Most lots range in size from one to two acres. Most of Eldorado is on the Eldorado community water system with some lots on private or shared wells. Underground utilities. Lots range in size from a couple of acres to 160 acres. With thousands of acres of dedicated open space, hiking and biking trails, the Galisteo Basin Preserve offers majestic views of the Galisteo Basin and numerous mountain ranges. Underground utilities. The village of Galisteo was founded before the Pueblo Revolt of 1680 by herders, farmers and ranchers. The village is very picturesque with many beautiful stone walled rambling old adobe houses, giant cottonwood trees and the Galisteo River (it would be called a creek in the more water rich areas of the country) bosque. Most lots range in size from two acres to six acres, are on a community water system and typically enjoy great views in all directions of the various mountain ranges. Close to Eldorado shopping and conveniences. Underground utilities. Most easily accessed from Avenida Eldorado, this area has lots ranging in size from just under five acres to over twelve acres. They are on a community water system and served by underground utilities. Many of the lots allow horses. Good area for mountain views. Easily accessed from Highway 285 this horse-friendly area (with some llama farms) consists mainly of 10 acre lots with some lots as large as 20 acres. Community water, underground utilities and mountain views. This area, a mix of equestrian and non equestrian properties, offers lots mostly ranging in size from 2.5 acres up to 11 acres. Easily accessed from Highway 285, there is a mix of properties on shared or private wells or on a community water system. Close to Eldorado amenities. Old Road Ranch is an area of pitched roof or Northern New Mexico style houses, many with studios. Lots generally are in the three acre to seven acre range. There are some significant horse operations with large arenas on much bigger pieces of land in the immediate area. 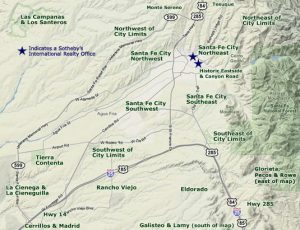 This is a location with excellent Sangre de Cristo, Jemez and Sandia Mountain views. The area is named after a road, no longer being used, that ran over the hill to the Village of Lamy. Community water and underground utilities. Lamy mailing address. Located on the outskirts of Galisteo Village, Ranchitos de Galisteo consists mostly of four to eight acre lots; water is provided by a community water system. The area has striking views of the Ortiz and San Pedro Mountains and the Galisteo Basin. Horses are allowed on some of the lots. Underground utilities. Located between Old Road Ranch and East Ranch, Rancho de Bosque allows pitched roof houses. Lots range in size from just over one-half acre to just under four acres. Horses are allowed on some of the lots. Hook up to a community gray water system for irrigation is available. Community water, underground utilities and good views of various mountain ranges. Lamy mailing address. Accessed from Spur Ranch Road just off Highway 285, Rancho San Lucas consists almost exclusively of contemporary style houses built by E.J. Jennings. Lots range in size from 2.5 acres to just over 3 acres. Western and southern views. Community water and underground utilities. The Ridges, a well treed area of rolling hills with most lots ranging in size from just over two acres to just under six acres, has some quite wonderful views of the various mountain ranges in addition to some Galisteo Basin vistas from certain lots. Some of the properties are horse friendly. Close to Eldorado amenities with underground utilities and community water. With most lots ranging in size from six acres to just over 12 acres (some horse-friendly), this area just off paved Avenida Eldorado has spectacular views of the Jemez, the Sangre de Cristo Mountains, the Sandias and the San Pedro and Ortiz Mountains. The area offers underground utilities and community water. With a Lamy mailing address, most lots in Tierra Colinas range in size from three to five acres. Horses are allowed on some of the properties. Many lots have stunning western and/or southern views. Horses are allowed in this relatively small subdivision consisting of mostly five acre lots. A community water system, easy access from Highway 285, close proximity to Eldorado amenities and mountain views are some of this area’s features.